The lookout above Kalalau Valley on the Na Pali Coast, provides one of the most fantastic views on the island and considered by many to be a must see. However, the drive to get here is long, narrow, and steep with lots of hairpin turns. If you're the type that gets motion sickness while driving, you might want to opt out of this trip. Also, it can be very disappointing to invest half the day getting here only to find clouds obscuring the view, because when it's cloudy, you won't see anything. Still, when the clouds part,and the sun is low on the horizon, be prepared for a view like no other. TIP: If you arrive and find the place socked in a cloud, wait a few minutes before leaving. Things might look completely different 30 minutes later. At 4,000 feet above sea level, the Kalalau Lookout is the highest elevation you will reach in Kauai by road alone. The air is much cooler at this level and it's a good idea to bring a coat or sweatshirt. 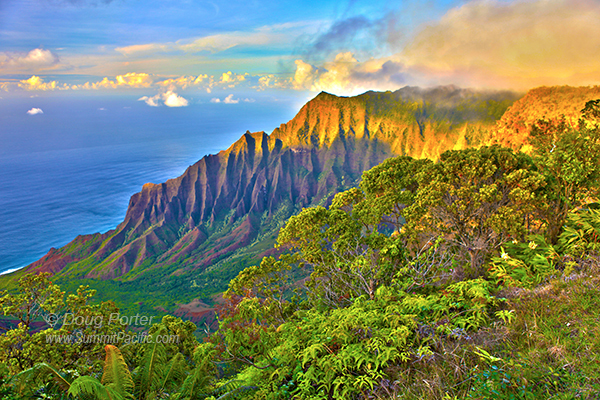 Kalalau Valley is part of the Na Pali Coast and there are no roads to it. The closest you can get to it by car is this overlook. The valley itself is two miles wide and one the widest on Kauai's west side. To get here, take Highway 50 west from Hanapepe toward Waimea. Turn right on Waimea Canyon Road just after mile marker #23. Kalalau Lookout is located near the end of the road at mile marker #18. Available facilities at the lookout point include restrooms and picnic tables.